Every spring when the NFL Draft rolls around, scouts and analysts look to compare the best collegiate players to established professional stars. This makes sense to a certain extent, as it provides a level of comfort and perspective for teams deciding between different prospects. The problem is that this process assumes every player entering the draft is comparable to someone else already in the NFL. This year, Marcus Mariota has become a polarizing prospect in large part because recent history has not provided us with an example quite like him. Mariota has been compared to Robert Griffin III and Johnny Manziel because of his running ability, Colin Kaepernick because of his build and Akili Smith because of his school. However, all of these are based more on the generic stereotype of the dual-threat college quarterback than on his actual skill set. In terms of making comparisons, Mariota presents a big problem. He’s too athletic to be your average pocket passer, but he’s too effective throwing the ball to be just another scrambling quarterback. His success in the Oregon system suggests he may not be able to make the leap to the pros, but his intangibles say he should be one of the greats. The NFL doesn’t have anyone like him, and for that reason he remains in the dreaded “other” category. The fact is the Heisman Trophy winner cannot really be compared to any single player, but he does showcase certain elements of NFL greats. 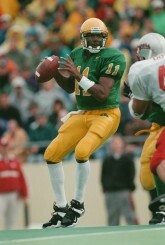 He possesses the underrated arm talent that Aaron Rodgers had coming out of Cal. He consistently embarrasses defenders with his explosive athleticism the same way that Michael Vick did in his prime. And, perhaps most importantly as he enters the professional ranks, he displays the calm, quiet poise and leadership of Joe Montana. Mariota, like anyone, is not perfect. Scouts are quick to point out that he could afford to tighten up his game in the red zone, throw a more consistent deep ball and cut back on the fumbles. These are the smaller flaws that are supported by the film. In 2012, conventional wisdom stated that Andrew Luck, a prototypical pocket-passer out of Stanford, was the new standard for NFL quarterback prospects and a sure bet to become a franchise quarterback. It is therefore important to examine Mariota’s flaws next to Luck’s. The red zone is where the spacing and tempo of Oregon’s offensive scheme are limited. Because this supposedly provides a better idea of how truly talented Mariota really is, analysts have pointed out his relatively weak 55.6 percent completion rate in the red zone in 2014. This is certainly an area where Mariota could improve, but he is in good company here. In 2009 and 2010 combined, Luck had a 54.8 percent completion rate in the red zone. He improved that number during his junior season, but he was still considered one of the best prospects of the generation and a certain franchise quarterback before he decided to return for the 2011 season. 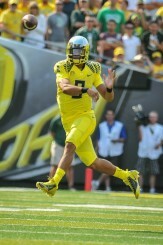 There is also room for Mariota to improve his deep accuracy. However, he still managed to lead the nation with 10 yards per passing attempt in 2014. This was largely due to his efficiency as a passer, showing that the home run is not always a necessary part of recording remarkable offensive numbers. Luck’s Cardinal posted 17 passing plays of 30 or more yards in his final season at Stanford. Mariota’s Ducks had nearly twice that, recording 32 plays of 30+ yards in 2014. This does not, on its own, necessarily demonstrate superior deep accuracy as Stanford’s primary targets during that time were tight ends running shorter routes, but it certainly shows that Mariota is capable of throwing long balls successfully. While Mariota does fumble the ball more than you would like to see from your quarterback, he more than makes up for it by protecting the ball through the air better than anyone ever has in college football. He threw 105 career touchdown passes to only 14 interceptions. That ratio of 7.5 touchdowns to interceptions is the best in college football history among qualified passers. Meanwhile, Luck threw 22 career interceptions and Jameis Winston, another beloved pocket passer and the only player to be taken ahead of Mariota in the draft, threw more interceptions (18) in 2014 alone than Oregon’s quarterback did in his entire three-year career. Any remaining questions about Mariota are just that — questions. They are not known negatives. The offensive system he ran at Oregon may not translate directly to the NFL, but his individual traits and intangibles are unquestionable. Clearly, any smaller flaws in his game will not detract from his ability to be a franchise quarterback or else scouts would not have fallen in love with Luck in 2012. It is easy to dispel tangible concerns about Mariota’s game. However, it remains hard to argue with the dogma that products of an up-tempo spread system just won’t cut it in the NFL, even when all evidence suggests the opposite. Many are quick to forget that Rodgers was supposed to be a product of his system, as well. He’s gone on to win two MVPs and a Super Bowl with the Packers. Mariota’s consistency over his three years as a starter was remarkable. He even won the Heisman Trophy with his all-conference left tackle and top-returning receiver sidelined with injuries for the entire year. Meanwhile, Winston went from a passer rating of 184 in 2013 to 145 in 2014 after losing his big receiver Kelvin Benjamin and his two leading rushers to the NFL. Griffin has struggled in the NFL due to injuries. Manziel has had trouble off the field. Kaepernick has had accuracy issues since college (he completed only 56.3 percent of his passes in 2008 and 2009 combined at Nevada) and Smith had only one great season under his belt when he was drafted. 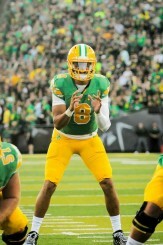 Mariota was selected No. 2 overall by the Tennessee Titans during last weekend’s draft. None of these concerns apply to Mariota. His injury history is almost nonexistent, and when he was hurt he played through it. He is as clean as can be off the field. He finished in the nation’s Top-10 in terms of accuracy in two out of his three seasons, and he dominated college football for three years. The myths and stereotypes that surround athletic quarterbacks are clearly still prevalent, but Mariota’s combination of talent, versatility and intangibles is unprecedented on the professional level. The NFL has never seen anything like him before, and in 10 years, scouts will likely be looking at quarterback prospects with a much different perspective than they are now because of him.